Why doesn't Srimati Radharani wear tilaka? Experts in Vaishnava culture say that "tilaka" is the name for any mark on the head made of clay and having sacred connotation. So, perhaps the actual question is, "why doesn't Srimati Radharani wear Gaudiya Vaishnava tilaka, in the style worn by followers of Chaitanya Mahaprabhu? Bhakti Vidya Purna Swami told me that the tilak that we wear is "Krishna's tilaka," and that Radha wears "Radha's tilaka." Traditionally, a woman places kunkuma on her forehead, and Radha also does so. In the shastra, scripture, she is described as having "a dot." This has morphed into bindis, which are pasted on the head for decoration, but this is not the same thing. Maharaja (BVP Swami) said that the kunkuma powder has an effect on the chakras of a woman and makes her peaceful. In his book Teachings of Lord Chaitanya, Srila Prabhupada says, "the mark of tilaka on Her [Srimati Radharani's] forehead is Her fortune." (Chapter 31). So She does wear tilaka, although it may not appear like the kind worn by Krishna's other devotees. But really, this question is like asking "Why is Krishna blue?" Ultimately the answer is, "Because He is!" All we know of Srimati Radharani is what is described in the shastra. And Her superexcellent qualities are only very minutely described. Krishna is the omnipotent, Supreme Person. He can appear however He likes, and He does so in unlimited ways in an unlimited number of forms. His name, "Krishna," means that He is the most attractive Person, and that's Who He is. He is the way He is, and appears the way He appears, for reasons of His own. We're making a mistake if we think we can understand the motives of the Unlimited Supreme Being with our very limited, insignificant brains. The color of His transcendental form is not a color of the world within our experience. Yet sometimes people nonetheless ask why He appears as He does, as if it could be explained in material terms, using material logic, to our materialistic mind. Krishna can't be understood by our power of reason, logic, or imagination. The best we can do is to learn how to love Him. Then, maybe, by His grace only, can we begin to appreciate His qualities, as they are, without trying to grasp what cannot be grasped. In the Brahma-samhita also, the color of Krishna's body is compared to that of a bluish cloud. The color of the Lord is not poetical imagination. There are authoritative descriptions in the Brahma-samhita, Srimad-Bhagavatam, Bhagavad-gita and many of the Puranas of the Lord's body, His weapons and all other paraphernalia. The Lord's appearance is described here as padma-garbharekshanam. His eyes resemble the inside of a lotus flower, and in His four hands He holds the four symbols: conchshell, discus, mace and lotus." Why does Lord Krishna only play the flute? Is there anything specifically mentioned somewhere? How is it that Krishna is nondifferent from His qualities? Krishna and His qualities are nondifferent, but Sri Krishna is also more than the sum of His qualities because His qualities are always increasing. It is explained in the Invocation to Sri Isopanishad, that Krishna is more than the sum of everything that comes from Him. This involves some transcendental math (one plus one equals infinity and one minus one equals one), because even as you isolate each of Krishna's qualities and then add them all together, you still won't get all of Krishna! What I'm trying to say is "they are Him, but He is not just them." Hope that makes sense to you ;-). Why does Krishna wear peacock feathers? It should be understood that Krishna is a person. He has His likes and dislikes, just as we all do. He likes it when His devotees offer Him things out of love. When He plays in the forest with His friends, He decorates Himself with the feathers left from the peacock. Once Lord Krishna created a wonderful festival in the forest by playing on His flute. In gratitude, the peacocks offered their feathers as dakshina (tribute). They requested the Lord to wear them in His turban and He agreed. Hope this answer is helpful and you enjoy the recording. I'm a devotee of Krishna—I know that Krishna is Vishnu's avatar, and that He came here 5000 years ago—and I've also heard a lot about aliens, UFOs, and space travel. Krishna fought demons that had big spaceships. If UFOs and aliens are real, who are they? Is Krishna also an alien being who came to earth in a dark blue form? First, Krishna is the origin of all incarnations and expansions, including the three Vishnu avatars. The first one, Mahavishnu, creates the total material energy known as the Maha Tattva. The second, Garbhodakshayi Vishnu, enters into all the universes to create diversities in each of them. The third, Kshirodakshayi Vishnu, is diffused as the all-pervading Supersoul in all the universes and is known as Paramatma, Who is present even within the atoms. Actually everyone is an alien in this material world. We all belong in Vaikuntha, the spiritual world. Each living entity is a spiritual spark, coming from Krishna and originating in Vaikuntha. Due to desire to enjoy the material world separate from the Lord, some souls come here to this earthly realm. This is a very alien atmosphere for us. We're meant to live in an eternal, blissful state, but find ourselves in a place where everything is temporary and full of misery. When Lord Krishna appeared here five thousand years ago, He came in His original form. Lord Krishna's body is spiritual. This means it is eternal (sat), full of knowledge (cit) and full of bliss (ananda). Each of us is meant to have a body qualitatively the same as Krishna's, and to live in a spiritual atmosphere, where our mood of service to Krishna allows us to experience our natural, spiritual qualities. Instead we come to this alien place, looking for cheap thrills. We settle for a body made of blood, pus and other horrible things and where everything is constantly getting old and dying, and hopes for happiness are destroyed by the temporary nature of the things we aspire to enjoy. In one sense Lord Krishna was also an "alien" when He came to the earth—because this isn't His original residence—but in another sense everything is His, and comes from Him. He's the proprietor of everything, so He can go wherever He wants, and appear however He wants—either via flower airplane, the speed of mind, or innumerable other traveling options. And when He travels He's not subject to the discomfort of the place He's visiting, He simply brings the wonderful spiritual qualities and atmosphere of His place with Him! You're also correct in saying that during the Mahabharata war there were aliens fighting with Krishna and others on the battlefield. Earth isn't the only planet in this material realm. Actually there are billions of galaxies in the material world—which is only a small section of the entire spiritual realm—and in each galaxy there are many, many planets. Some are heavenly, some are hellish, and some are in-between. On each and every planet there are living entities with different bodies. Many residents of these planets are very advanced in yoga and other mystical sciences, so they can travel at will to different planets. In the Mahabharata war there were visitors from higher planets assisting both personally and by allowing warriors to use their weaponry. However, it's also a fact that wherever in this material world one is, one is an alien; because our original place is in the spiritual world with Krishna! 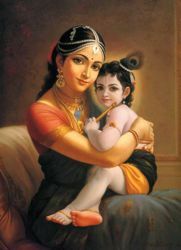 I've been looking at some beautiful paintings that represent Krishna and would like to know some more about him. Why is he blue? Did he play the flute? Did he ever die? Krishna is the origin of everything, so the blue of the sky is a reflection of His skin color. He is what color He is, and there's no material "reason" for it, the way there are reasons for why our skin is a certain color (pigmentation, chemicals, etc.). Someone once asked Srila Prabhupada, our spiritual master this question, and he replied, "Ask Him!" Yes, Krishna plays the flute. He uses the flute as a means of communication. He calls the cows—each by their own "note." He also calls His devotees, who are very attracted by His flute song. Krishna also transmits knowledge via various ragas on His flute. He has many flutes—of various sizes and made of various materials—which He plays. Lord Krishna is the Supreme Personality of Godhead. He is eternal, ever-youthful and never dies. He is always existing and always engaged in His loving pastimes with His devotees. What is the origin of Krishna and of all other souls? By definition, the Supreme Person, Krishna has no origin. He is described in many places as anadi, without beginning, and sarva karana karanam, the cause of everything; yet He himself has no cause. The living entities—all other persons—are also eternal. Krishna is their source, but they have the same spiritual nature and are therefore also eternal. "The Personality of Godhead is pure, being free from all contaminations of material tinges. He is the Absolute Truth and the embodiment of full and perfect knowledge. He is all-pervading, without beginning or end, and without rival. O Narada, O great sage, the great thinkers can know Him when completely freed from all material hankerings and when sheltered under undisturbed conditions of the senses. Otherwise, by untenable arguments, all is distorted, and the Lord disappears from our sight.